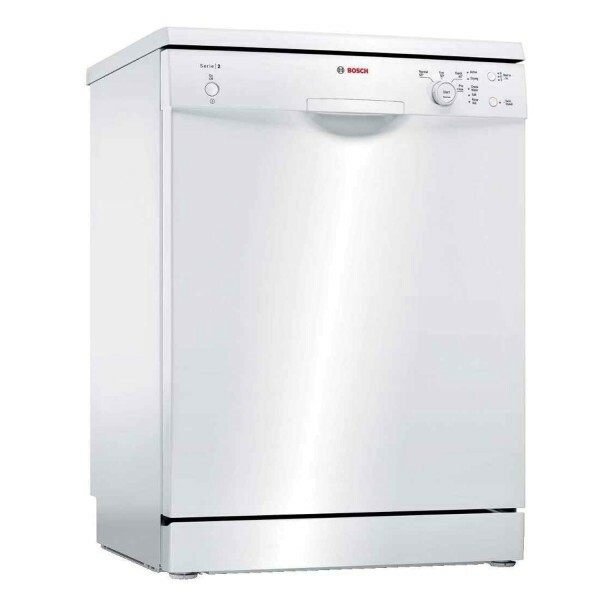 Product information "Bosch 60cm Wide Dishwasher - SMS24AW01GB"
This Bosch Serie 2 dishwasher makes the after dinner clean-up totally effortless. It washes 12 place settings at once, so its perfect for small households. If you have guests coming over and need dishes clean in a hurry, the handy 29 minute quick wash leaves everything sparkling. Thanks to the clever VarioFlex baskets, you can rearrange and adjust the shelves inside to fit your larger pots and pans. The Bosch SMS24AWO1G also has an ecoSilence drive which has fewer moving parts to make it perform really quietly, so it wont make too much noise when its running. The Bosch SMS24AWO1G uses only 11.7 litres of water per cycle putting it in line with some of the best dishwashers on the market and MUCH more water efficient than washing up by hand. It is also A rated and uses approximately 290 Kwh per annum. Related links to "Bosch 60cm Wide Dishwasher - SMS24AW01GB"
Customer evaluation for "Bosch 60cm Wide Dishwasher - SMS24AW01GB"